“'You’re adopted,' she said, quick as you like, and slapped her hands over her mouth. The words had barely reached my ears when everything went north of normal. Mam erupted into a shaking mess of tears. 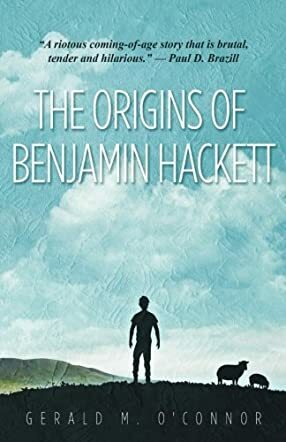 Dad recoiled with a feverish look to him; his ruddy face deepening to purple and his eyes enlarging to the size of cue balls.” The Origins of Benjamin Hackett by Gerald M. O'Connor is a refreshing coming of age story that is sentimental, bold and hilarious at the same time. Set in Ireland in the summer of '96, 18-year-old Benjamin Hackett finds out that he was adopted. He decides to look for his birth parents and drags his friend JJ with him, traveling all over Cork city while facing unexpected problems along the way. If you think you’ll find another typical coming of age tale among the pages of The Origins of Benjamin Hackett, it’s best to leave your expectations at the door. O'Connor can definitely make readers feel the heavy past of the Irish land which doesn’t just serve as a mere background for the story. That said, despite the episodic heaviness and contemplation, the story isn’t without its heartwarming, funny and respectable moments, making it fascinating and enjoyable to read. O’Connor’s vivid prose is perhaps even more perceptive in quirky moments, and the plot has solid and unpredictable twists. All in all, this is an unforeseen and profoundly moving tale from O’Connor, a satisfying read where the story concludes with a fitting ending.